Surgical resection of mandible has to be done to treat various odontogenic epithelial tumours. Prosthodontic rehabilitation of the hemimandibulectomy patients with functional & aesthetic acceptance by the patient is the most difficult task. Guide flange appliance is given to correct deviation as well as permitting function of mastication & speech. Thus here two different case reports are discussed with removable & fixed guide flange appliances. The prosthodontic rehabilitation of mandibular defects is of great challenge. Prognosis for these patients has been improved with continuing improvement in surgical resection & reconstruction techniques, yet morbidity and incomplete rehabilitation persists .That affects aesthetics, speech & function. In general, patients with extensive soft tissue loss resulting from tight wound closure, radiation therapy, and those requiring classical redical neck dissections exhibit the most severe mandibular deviation & dysfunction. Various techniques have been described to reduce mandibular deviation by retraining the patient's neuromuscular system. These include early corrective mandibular movement therapy, physiological exercise programs, and removable partial dentures for partially edentulous and complete denture prostheses for edentulous patients with modification in occlusal scheme to compensate for deviation. This prosthesis can be removable or fixed. Removable prosthesis gets support from both teeth and tissues. So it cannot be retained intraorally if only a few teeth remained in the sectioned mandible. Fixed mandibular guiding flange appliance gets support from teeth and can be given to the patients with limited mouth opening & who lack motor skills to manage a removable prosthesis. Mandibular guide flange appliance is commonly used and has been the subject of many studies. Ackerman advocated use of intermaxillary fixation or guidance prosthesis (similar to swing-lock RPD) immediately postoperatively. He stated that IMF reduced mandibular deviation. Robinson and Rubright stated use of preoperative mounted casts to fabricate temporary acrylic resin mandibular guiding flange prosthesis. It was inserted on third postoperative day and worn for 1 year. Definite prosthesis was made of cast metal RPD with buccal extensions. In 1979, Desjardins made a training device with maxillary palatal inclined plane, palatal to the posterior teeth on the nondefect side. Cantor and Curlis found that the residual mandible can be guided to a centric occlusion position when mandibular teeth are retained. 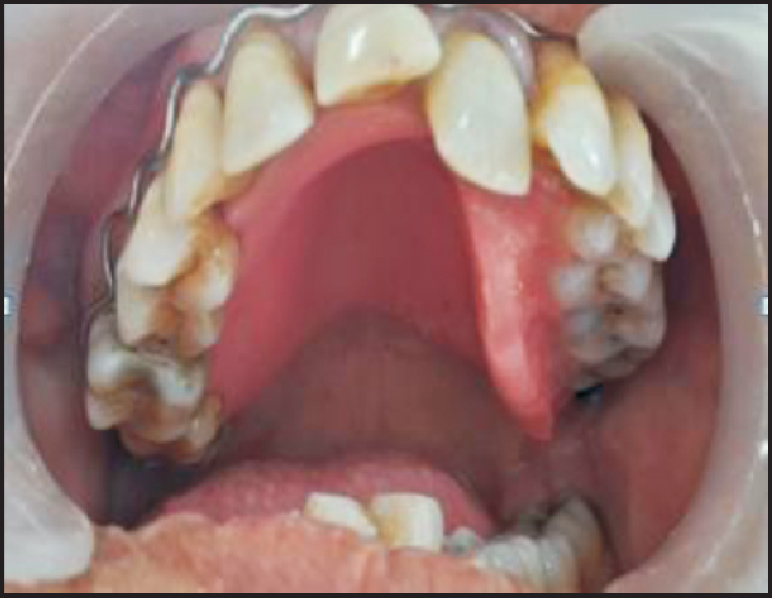 Here, two case reports discussed early prosthodontic management (during initial healing period of the reconstructed mandible) of two patients who have undergone hemimandibulectomy treated with two different (removable & fixed) guide flange prosthesis. Fabrication procedure is discussed for each case. A 50 year old female patient, chandaben came to the department of prosthodontia, Govt dental college and hospital, Ahmedabad with the chief complaint of difficulty in chewing. She was operated for surgical resection of right half of the mandible including ramus and angle of mandible before 3 months due to ameloblastoma. Post operative IMF was given for 1 month to reduce deviation of mandible. On examination, she had deviation of mandible to the right side with limited mouth opening resulting in difficulty in speech and mastication. Left canine, Premolars and molars were present on contra lateral side of mandible & they were periodontally compromised with grade 2 mobility and grade 1 recession. Therefore it was decided to give a removable guide flange appliance with palatal ramp to the patient. Maxillary and mandibular impressions were made with irreversible hydrocolloid impression material and casts were made from class 3 dental stone. Continuous circumferential clasp with 19 gauge wire was adapted on maxillary cast extending from left second molar to right second molar. The guide flange was tried in patient's mouth and adjusted accordingly. Post insertion instructions are given to the patient and recalled after 72 hours and then every 1 week for 1 month to evaluate strain, pain in TMJ and muscles, periodontal condition of teeth. 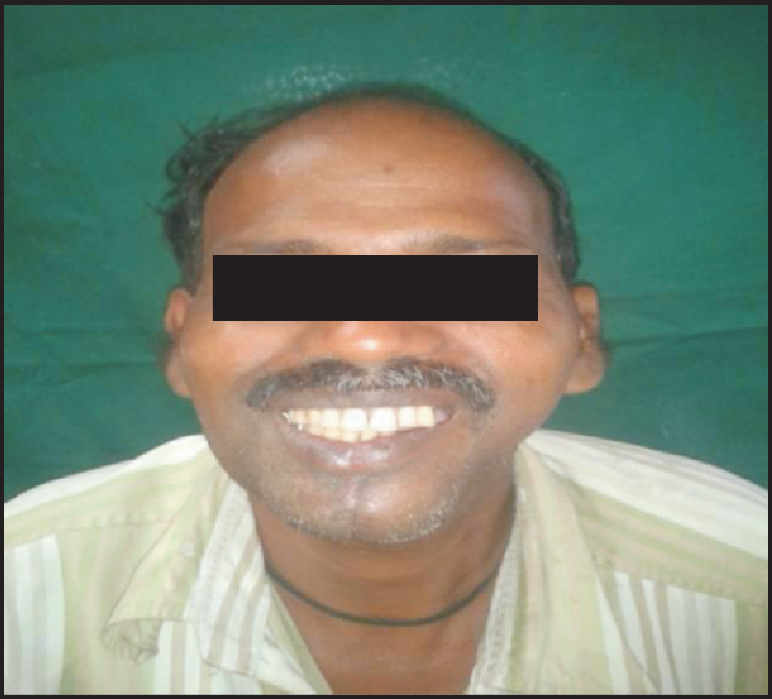 A 41 years old, Hindu male patient, Sataibhai came to the department of prosthodontia, Govt dental college and hospital, Ahmedabad with the chief complaint of difficulty in chewing. He had undergone surgical resection of left half of the mandible including ramus and angle of mandible before 2 months due to squamous cell carcinoma. IMF was not given. On examination, he had deviation of mandible to the left side with limited mouth opening resulting in difficulty in speech and mastication. [Figure 6] He had retained all the natural teeth on opposite side with good periodontal condition. The patient was evaluated for fabrication of fixed guide flange prosthesis. Patient's mandible could be manually placed into centric occlusion without excessive force. So it was decided to give patient a fixed guiding flange appliance consisting of a molar band with a U loop cemented to mandibular molar as a part of early management. Orthodontic tooth separators are placed around mesial and distal interdental space around mandibular molar for 48 hours to create interdental space for placement of Band. After separator removal, a band is adapted intraorally according to the contour of mandibular first molar and welded. After that Maxillary and segmental mandibular impressions with band are taken with irreversible hydrocolloid impression material, and casts are made with type 3 dental stone. So the resulting mandibular cast contains band in the cast. Articulate the maxillary and mandibular cast at maximum centric relation the patient can give with occlusal recording wax. A 1 mm thick and 5 cm long wrought wire is bended in the shape of U and incorporated with a tube of 10 mm in length at the base of the U, which freely rotates around the wire. [Figure 5] The height of the U loop is adjusted on mounting with band such that the tube will be placed horizontally at the level of buccal surface of maxillary posteriors when the teeth are in articulations. It is then soldered to the band. [Figure 4] A final adjustment of loop is done after trying the appliance on mandibular molar in patient's mouth depending on extent of deviation such that it guides the mandible into centric occlusion. After fitting and function of the appliance is confirmed with minimum strain on patient, it is cemented to proposed tooth. 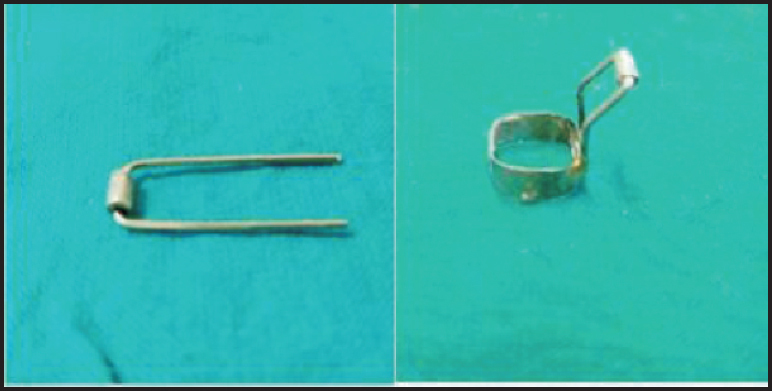 [Figure 6] Post cementation instructions are given to the patient. Patient is recalled after 72 hours and then every week after cementation to evaluate strain, pain in TMJ and muscles, periodontal condition of teeth. It is difficult to predict the amount of severity of potential mandibular deviation. The beginning of prosthodontic rehabilitation, amount and location of radiation therapy, patient's physical condition and mental attitude towards rehabilitation also contribute to prognosis. There is no general agreement among prosthodontists as to which prostheses should be used , when ,or how long. Physiotherapy and exercise programs are mentioned in literature and commonly used. Dentulous patients are easier to retrain to achieve more normal mandibular movements, to facilitate mastication, and to improve appearance compared to edentulous patients. Palatal guidance ramps or mandibular guide flange prostheses are commonly used for this purpose. In edentulous patients, dentures are designed with palatal guide ramp or widened occlusal table to compensate for the deviation. - Patients who lack motor skills to manage removable prostheses with periodontally sound teeth. Advantages of fixed prosthesis over removable prostheses: 6 functional, aesthetics, comfortable and easy to fabricate and repair. However patients with periodontally compromised teeth can be given removable guide flange prostheses with buccal or palatal ramp. Beumer J III, Marunick MT, Curtis TA. Acquired defect of the mandible. In: Beumer J III, Curtis TA, Marunick MT, eds. Maxillofacial Rehabilitation Prosthodontic and surgical considerations 2nd ed. St. Louis, Mo: Ishiyaku Euroamerica; 1996. p. 184-216. Robert LS , Thomas DT. Mandibular resection guidance prostheses: A Literature review: J Prosthet Dent. 1996;55:84-86. Cantor R, Curtis TA. Prosthetic management of edentulous mandibulectomy patients: Part II, Clinical procedures. J Prosthet Dent 1971;25:546-55. Shafer WG, Hine MK, Levy BM, Tomich CE. A textbook of oral pathology. 4ed. Philadelphia; WB Saunders; 1993. p. 86-229. Ackerman AJ. Prosthetic management of oral and facial defects following cancer surgery. J Prosthet Dent 1955;5:413-432. Robinson J E, Rubright W C. Use of a guide plane for maintaining the residual fragment in partial or hemimandibulectomy. J Prosthet Dent 1964; 14:992 -999.